What makes a plant native? Pity plants can’t read. It would make the work of plant scientists easier. However plants refuse to be labeled and are content to get on with whatever they are doing. As such, pigeonholing plants into “native” and “non-native” categories is somewhat arbitrary. It all comes down to geographic or spatial scale. Are we talking about native to planet Earth or native to your backyard? Biological and social scientists have differing criteria when deciding this issue. A common definition of a native plant in the United States is one that was growing in situ prior to the Age of Discovery, when modern sailing ships and celestial navigation made the worldwide transport of plant material possible. This might work for insular pre-colonial America, but how does this work for the rest of the world? Indigenous peoples in the Americas were spreading plants around way before strangers showed up on the beach. A working definition of a native plant might be a plant species that evolved in a defined geological time frame and is growing and reproducing in a specific geographical area. This definition has holes, as migrating birds and other animals readily spread plants around, and seed can sail the ocean blue. Obviously, native plants are not easily defined. We horticulturists practically speak of native plants as those found growing and reproducing locally – define locally for yourself – and were not introduced by man. Can an introduced plant ever be considered native? A plant that has survived locally and reproduced itself over a long time period but is not necessarily invasive is commonly referred to as a naturalized plant. They are not strictly native, since they did not evolve there, but certainly have made themselves at home with minimum impact on the landscape. 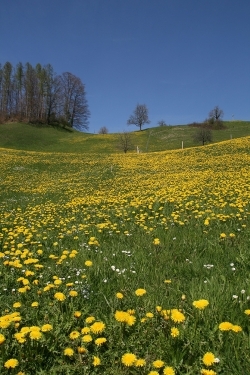 The common dandelion, thought to be native, is actually naturalized from Eurasia. Invasive plant species that can harm ecosystems can naturalize and dominate an area over time. I suppose if a plant remains long enough in an area and evolves, then by definition it eventually would become a native.